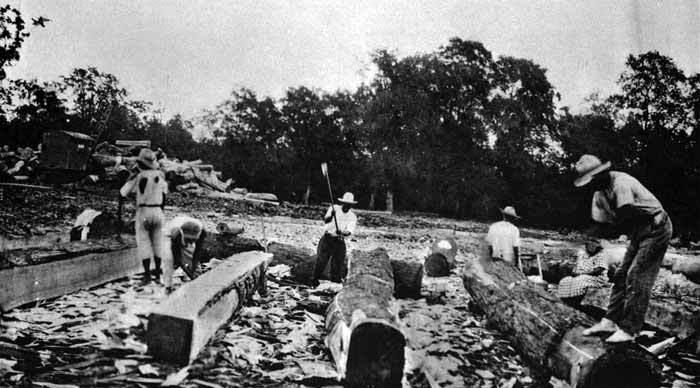 The economy of Belize once depended heavily on forestry-based industry….especially during the second half of the 1800’s and first half of the 1900’s, it provided most of the jobs in what was then a British colony. Logwood for production of dye….and mahogany for furniture production….were the principal contributors to this export-oriented business. In the second half of the 1900’s, pine lumber for the domestic construction industry became of importance, until the pine bark beetle wreaked havoc on our pine forest stocks in the late 1900’s. More recently, the prized rosewood has been in the news…and the mahogany is still the center of our national emblem. Since the middle of the 1900’s, with largely depleted forestry stock….and with the advent of the land reforms of that period….Belize moved away from forestry and towards a more agrarian economy. Did we miss the boat? Did we have to give up apples so that we can have oranges? Could we have had both? Is this question still relevant? Allow me to argue that we should have reinvested heavily in forestry…..even as we diversified into agribusiness……and that this opportunity has still not escaped us. Belize’s subtropical climate, soil types, water supply and topography is fertile environment for the thriving of many valuable forest species. Mahogany, cedar, pine, rosewood, zericote, jobillo, granadillo, santa maria, cabbage bark, sapodilla, botan, teak, palmetto, bamboo, mangrove….offers timber wood for a wide range of uses, from frame boards, to charcoal, marina planks and exotic furniture and gift items. There are many more valuable forest species other than wood supply…..bayleaf, xate, ak, orchids, peat moss, heart of palm, cohune, mushrooms, herbal medicines, gums, resins, essential oils, flowering species…..to name a few. Belize is rapidly replacing timber wood with steel in our construction industry. The principal driver behind this trend is the declining forest stocks which caused increased prices, lack of availability and lower quality from early harvesting. Steel is imported and sold at prices not much higher than what timber wood is available for….and there is a perception that it is more durable…hence a better investment. Steel imports have grown exponentially…..while local timber wood production has declined significantly….most of the pine lumber and plywood board being used in Belize today is imported from the USA and Brazil. As a country…..we have agreed to give up our own production from our natural resources….and jobs…..instead to ship away our money to create jobs for others abroad. We will never produce steel in Belize…. We can stick our heads in the sand and say that forestry is a lost opportunity….especially if we follow the short-term, short-sighted policies that our governments have been exposing since Independence….or we can choose otherwise…..and start a programmed effort to build back our timber wood stocks….while developing other non-timber resources as well. Many jobs will be created from the get go….as forestry investments are very labor intensive. Belize currently has a planted population of an estimated 10,000 mahogany trees…..which in 30 years will value $40 million at current prices….with little to no maintenance cost. We should plant another 5,000 every year for the next twenty years. 1. FAO as a development partner should be requested to help Belize with putting together a timber wood development plan…with short, medium and long term goals…and including sustainable financing models for the plan. 2. All co-management agreements with NGO’s operating inland should be amended to include conditions that require programmed investments in timber wood as a percentage of their total land holdings. 3. More private investments in timber wood forest should be encouraged, by government allowing for a portion of such investments to be deducted from land taxes due. 4. 50% of the Protected Areas Conservation Trust (PACT) growing revenue, currently at around $3 million per annum, should by policy be directed into a National Forestry Development Fund (NFDF), which is co-invested with private land owners and NGO land holders in timber wood forest investments….on a competitive basis…including providing incentives for ranchers to plant fence lines with timber wood species. 5. All the revenues from royalties collected on forestry products should be re-invested back through the NFDF in timber wood reforestation. 6. The Ministry of Forestry, Fisheries and Sustainable Development budget should be increased from $6.65 million to $13 million….with all the additional funds invested in a massive long-term program for development of the pine forests….creating around 300 full time jobs in the Mountain Pine Ridge (MPR). This should be done in a way that enhances the tourism potential of the MPR. 7. Our laws should be modified to allow for a more free flow of timber wood stocks from Guatemala, Honduras and Nicaragua via Belize and traded into the Caribbean and other markets. This will in the short term also supply the needs of our exotic furniture manufacturing industries, so that they can supply quantities being demanded in Mexico and beyond. 8. The import duty on steel should be raised by 10%, and those additional revenues invested in the NFDF. 9. The laws that govern the NFDF should allow for marketable financial instruments that can attract international financing for timber wood forestry investments in Belize….including, but not limited to, carbon trading and debt-for-nature swaps.